I think you wrote "My future's so bright...I gotta wear shades." It's been a year and a half since you left us, a year and a half since I heard your voice, a year and a half since you made me laugh, a year and a half since you saw something on the news about Alabama and you called me to see if I knew the person in the article (usually I knew them or was one degree away). It's been a year and a half since I lost one of the best friends I've ever had. It's been a year and a half since I said "Chriyyyyyaaasssss…say "Fuhgettaboutit" and I laughed hysterically. I keep up with your boys via social media and I wonder every day how they get through without the center of their family- the person who held it all together- the guy who raised half of the neighborhood. I wonder if they know how stressed you were raising them on your own or if they have a clue how many sets of dishes you bought that just kept disappearing in your house. I remember the day you said you made everyone clean out their rooms, under their beds and closets, and you found baskets of socks and underwear and way too many dishes to fit into your cabinets. You said you'd just kept buying more socks, more underwear, and more dishes. I laughed so hard that day listening to your cleaning antics that I cried. 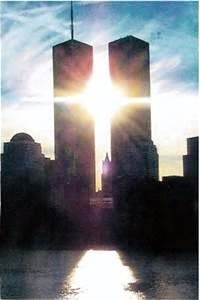 I think about the days that followed 9-11, especially the first day you went back to work in Midtown. I remember you calling me and saying "Can you just stay on the phone with me until I get there? I am hearing ambulances and police cars and I am scared." Scared? You'd never been scared of anything in your life. You're from Brooklyn, you're a New Yorker. But that day, I could hear your voice quiver and I knew that 9-11 is not something you could just put behind you. You couldn't just move on with your life without that being such a big part of you. It changed you. I wonder how you kept your wits about you to help navigate five people down 90 floors, through jet fuel, sheetrock dust, debris, and God only knows what else you inhaled that day. I wonder how you closed your eyes at night without hearing the thuds of bodies hitting the ground. How did you sleep that first year without seeing people fall from the towers to keep from burning? I don't know how you made it through every day and kept your crap together, but you did, and I still can't comprehend how you did that. Some days I wonder if that's what happened to your heart, 9-11? I know you smoked more than you should have and, like me, you enjoyed eating junk food way more than you should have. I wonder if your heart broke a little bit that day? And as reality set in, I wonder if it broke just a little bit more every day until it finally couldn't take anymore. I am so grateful that you took me on a personal tour of the memorial. I am so thankful that I had the opportunity to walk through it with you and have a slice downtown that day. We found a coke that had your name on it, like it was a fated visit. I had no idea it would be the last time I would see you. I cannot believe that you let that dang steamroller hit my rental car in your neighborhood and then you called me a bad driver? All the way to Manhattan, all you could say was "It's not my fault you backwoods Alabama hillbillies can't drive in Brooklyn." What was crazier is that the rental company said nothing when I returned it and said that I'd been hit- he just said "Look lady, it's New York. We don't check for scratches, okay? Now, get outta here." I remember the year you were working in World Trade I, and I sent your birthday present wrapped in hot pink paper, in a Keds shoe box- little girls, size 10. The guys you worked with gave you hell, I knew they would. When Ashley Banfield would report from the Fresh kills landfill on the news, I always looked for that pink box you had saved and had passed around your office as a joke. We were probably the only people laughing in the entire World Trade Center Museum, because you said "Look, I've already been here and I have to tell you the bad news... the damned pink shoe box didn't make it, okay? Do not be disappointed." You were a good friend to me. One of the only people in the world who knew all of my secrets and never judged, never criticized, and just told me straight. Once you told me I was spoiled and that I expected too much from people, and I never forgot it. You being you, you followed up your salty commentary by telling me that I gave a lot back-that I was a good wife and a great mom- so it was okay for me to expect a lot. I needed to hear that at that particular time in my life, all of it. You always knew what to say to shock me back into reality when things were total crap. I never would have made it through 1998 without your friendship after my Grandfather died. 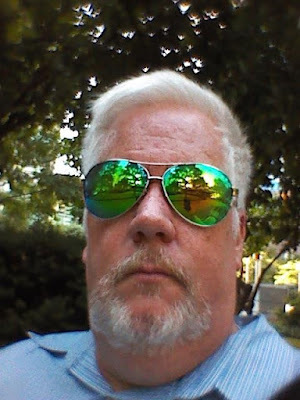 You were a sounding board and a great friend. I bet we cried ten million tears together and laughed that many more times. You got a bad deal because of 9-11. Your company moved, downsized, and you became collateral damage- in so many ways. You never gave up hope, though, and that is the Chris we all loved- the eternal optimist, the comedian, the friend who was loyal until the very last morning you took your very last breath. I will never think of 9-11 without thinking of the day I thought we'd lost you, and then remember the January 16th, when we truly did lose you. I hope you are flying high and will never have to worry about this world again. Until I see you on the other side, rest well my friend. You are missed. Every day, you are missed. You, you are an American hero- or at least the closest thing to one I will ever meet in this lifetime. It was a privilege of my life knowing you and an even greater one calling you friend. Thankful for the life of one of my best friends in the world today, Chris Egan. Thirteen years ago today, I was in my home office, when my husband (then fiance') called me from Troy, Alabama, to tell me that the World Trade Center had been hit by a plane. He asked me "Which building is your friend Chris in?" I said "He's in World Trade One." Jimbo said "Pray, because it hit around the 90th floor...and it doesn't look good." Chris worked on the 90th floor of WTC 1. I immediately ran and turned on MSNBC in time to see the second plane hit, while frantically trying to dial Chris's work number and cell phone. What was weird about the timing, is that we talk almost every morning around that time- nine o'clock- always have. Chris was really excited about the newly opened Krispy Kreme doughnuts in the food court, and I was praying that he was downstairs getting a hot glazed doughnut. Phone lines were down and jammed all over Manhattan, and I couldn't get through, not to mention the cell tower on WTC 1 was damaged. He worked for an international bank at the time, so I called his home office in Luxembourg, thinking that they would have a contact for everyone there. They informed me that Chris had made it down to the plaza with five others, but that someone thought they saw him go back inside the building to help. They believed he was dead. I refused to believe it, and knew that if ANYONE could make it out, he could. He smokes, and always illegally smoked in the stairwell on the 90th floor. I knew that he knew ALL of the exits. My daughter, now a registered nurse, was in elementary school. I picked her up from school, and we went straight to the Red Cross to give blood- believing that there would be survivors who would need blood. We sat with hundreds of others also there to give blood, as we watched the horrific scenes replayed over and over on the big screen television on the wall. With strangers, we watched the President's address. It was surreal. Strangers were there together, crying and hugging one another. People from all backgrounds and socio-economic statuses were there to truly give of themselves, to give their blood to hope and make a difference. In Alabama, so far away, we didn't know what else to do...and I think most people were desperate to do something, anything. It was 2am before it was my turn to roll up my sleeve, and the nurse couldn't find a vein. I remember telling him "Then you'd better get a ziplock and an x-acto blade, because my friend is in that tower and you are getting some of my blood tonight!" Finally, another tech came over and found the vein. The Red Cross didn't close that night- they worked all night long in the Birmingham Southside office. I called every hospital in Manhattan looking for Chris. I called the make-shift morgue that the Port Authority had set up in New Jersey at a park, thinking that they would have so many bodies to process, yet they had hardly none. I emailed every person on every email he had every forwarded me, hoping that someone knew where he was and had heard from him...no one answered. I called the police precincts and a cop with a heavy Brooklyn accent took my number and was so kind to call me back and check to see if I had found my friend days later. It was a frantic search that lasted for days via telephone that ended in no information to be had until Friday. On September14th, I received a call from Luxembourg informing me that they had been in touch with Chris, and that he was indeed alive, and to tell me that he would call as soon as he could get a phone line out, because the phone lines were still so jammed. I talked to him on the 16th, and it was the best phone call I have ever gotten in my life. Never had I been so glad to hear my friend's voice on the other end of the line. Chris is like a brother to me. We became friends in 1998 shortly after my Grandfather died and he was the best friend a person could have when going through something like that. We still talk every day and have shared every part of our lives from his divorce, to crazy stories about our children, dating and marriage, career decisions, home purchases, the whole nine yards. He has a new love, Karen, and they are so happy. He has such a full, wonderful life. He has four beautiful children who would have been devastated that day, had he not returned. One of his sons watched it all on television, while a boy at school kept saying to him "Your daddy's dead...your daddy's dead." Chris said that for days his son, Timmy, wouldn't let go of him. I am thankful to still have my friend with us and that I know God still has great plans for his life. I am thankful that his children weren't orphaned that day. I am thankful that he lived so that Karen could have the love that he has in his heart showered into her life. With all of that being said, I cannot fathom what the families who lost their Dad, Husband, Grandfather, Mother, Wife, Grandmother, Sister, Brother, Best friend, Fiance', Neighbor, Son, Daughter, or Co-worker, went through that day and the weeks following. My heart breaks for them all, and I vow to NEVER FORGET. The outpouring of love in the days that followed 9-11, were like the days in Alabama following the tornadoes. I wish that it didn't take a terrorist attack or a natural disaster for us to all truly show the love that is in all of our hearts to one another on a daily basis. As we mourn for the dead, and celebrate the living, let's try to love one another a little more. It was July 1978, and hotter than a six shooter. My cousin Jason and I had made our usual escape into Pa Julian’s 1971 red Maverick immediately following Sunday school. It had snuff running down the side of it and probably hadn’t been washed since Pa bought it and the Maverick was six years old. I was six that summer, just like the Maverick, and was spending most of the summer in Bradley, Alabama, while my mother was completing her work contract in Daytona Beach, Florida. I loved summers in Bradley at Bigmama’s and Pa’s house. Bigmama played the piano like a drunk Jerry Lee Lewis trying to get right, and Pa didn’t believe in all of that Pentecostal carrying on, so he went to Sunday school, only, and then broke the hell out of there like any good Baptist would. He said that his daddy was a preacher, he’d gone to preaching every day at Mount Berry College in Mount Berry, Georgia, and he’d even run a revival once in Florida, so he didn’t need any more church. Betty never fussed. We knew like clockwork that Julian would be heading to the Maverick once preaching commenced. Jason and I hid in the floorboard of the snuff covered car full of fish guts, worm hooks, and empty snuff cans. We hunched down in the back, giggling, and were forced to hold our noses the entire way home. Pa pretended not to notice us, but he knew we were there. When we arrived at home, about a half a mile around the curve in the road, we popped up to let Pa know that we were stowaways. Like every time that we had done it before, Julian said….”Look at you sorry bunch of hacklebacks! Betty is gonna tan yore hide when she sees you youngins.” We laughed, changed into our swim suits, and then headed down to the creek, across the street from the house. We’d been down there about ten minutes when the cars started down the red dirt road hill. One after the other they came down and out poured the ladies in dresses, and the men in short sleeved dress shirts with pocket protectors and clip on ties. Betty and her green Malibu were in the lineup. OH LORD! When we saw her climb out of the car in her Thelma Harper polyester dress, and her support stockings that connected to her girdle and garters, we immediately remembered what had been announced at church. It was baptism Sunday! The next thing you know, we were making a fast decision about what to do next. Jason was 10, so he was always bossing me. Boojee and Jennifer were with us that Sunday and they were older and made the executive decision to hide We knew that if were caught "half-naked" at the creek in front of the church people- especially us girls- that Betty would take us down to Fly Flap City and break at least three fly flaps on us. She had quite a collection. We ran out of the creek and hid in the trees on the other side in he woods and watched the baptisms. We almost went down and crossed the creek further up, and were going to sneak up to the house without ever been seen, but it was too deep, so we remained. Figuring if we could wait out the baptisms until everyone was gone, we could sneak back up the hill and go in the side door without being noticed. By then, Bigmama would be putting dinner on the table, but we never made it to the side door before she saw us. I don't remember anything ever taking longer in that baptism in my entire life, until Aretha Franklin's funeral last week. Seems like when you go swimming, the minute you get wet and have a swimsuit on, you have to pee. We were freezing wet, and we needed to pee. On top of trying to be still, quiet, and invisible, we had to pee and were doing a rain dance in our minds while biting our purple shivering lips. 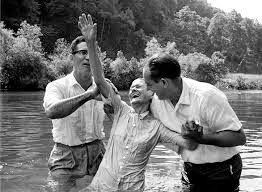 Joe and Rufus and Thomas Earle were in the creek with the people being baptized. There were a lot of hallelujahs in the air that day. Rube Timothy was standing on the creek bank praying and smiling that huge smile of his. That little man could pray, Lord, could he pray! One after the other, the baptism candidates came to the water to wash away their sins, but it didn't stop there. Shouting commenced, hands were raised, arms were waving and everyone was praying down heaven. The Holy Ghost had apparently come to party, because Bigmama stood on the creek bank praying and speaking in tongues for what seemed like forever, I mean forever. We knew Bigmama would be the last one out of there and figured once she was done, we could stealthily head back to the house and blame forgetting about the baptism on Pa and act like we'd been playing the whole time in the yard. Finally, around 2 o'clock, after every single person had driven or walked up the hill, Bigmama stood on the creek bank in her Thelma Harper dress, her Mason catalog shoes, and her Kevlar stockings. She yelled in the highest pitched voice you've ever heard "Hollllleeeeee, Jaaaasssssson, Boojeeee, Jennnnnnifer! You boys had better get up that hill!" She had known we were there the whole time. She always knew exactly what we were up to and chose the appropriate fly flap, according to our deed. That baptism Sunday I won my first trip ever- an all expenses paid trip to Fly Flap City.